A biceps tendon rupture often occur after a sudden contraction of the biceps with resistance to flexion of the elbow and supination of the forearm. This can further be aggravated by the intrinsic degeneration of the tendon release and frictional wear of the tendon belly. This intrinsic degeneration is caused by improper training or fatigue. Inordinate stresses can be placed on the biceps as it attempts to compensate for other muscles. This can lead to attrition and failure, either within the tendon substance or at its origin. The biceps brachii muscle consists of 2 parts: The long head and the short head. The long head originates at the supraglenoid tubercle and is attached to the dorsal aspect of the radial tuburosity. It runs intra-articularly over the humeral head and follows the bicipital groove distal to the glenohumeral joint. It functions as dynamic stabilizer of the glenohumeral joint, as well as a depressor of the humeral head. The short head is a functions more in elbow flexor, while the long head functions more in forearm supination. The parts of the tendon differ in shape. The intra-articular part is wide and flat while the extra-articular part is rounder and smaller. The articular portion of the long head of biceps is vascularly supplied by the anterior circumflex artery, mostly to the proximal tendon. The distal portion is fibrocartilaginous and avascular. Soft-tissue stabilizes the extra-articular long head of biceps when it enters the bicipital groove en this is built by fibers of the coracohumeral ligament, superior glenohumeral ligament and parts of the subscapularis tendon. Biceps tendon rupture mainly occurs in individuals between 40 and 60 years who already have a history of shoulder problems. It mostly affects the dominant arm. A biceps tendon tear can also occur in younger individuals, but usually after a traumatic fall on an outstretched arm, heavy weightlifting or consistently sport activities such as snowboarding and soccer. Tendon rupture usually results from sudden contraction of the biceps associated with resisted elbow flexion and supination of the forearm. A possible predisposing role is played by intrinsic degeneration of the tendon tissue or frictional wear of the tendon belly. Patients with a long head biceps rupture report a wide variety of symptoms. Anti-inflammatory medications can be used to reduce the underlying inflammatory process that may predispose tendons to rupture. When tendons are stressed or partially disrupted, anti-inflammatory medications can be used as analgesia. Non-operative management is considered appropriate for older patients or patients who do not require a high level of supination strength. This is also considered for subacute or chronic biceps tendon tears. There are no consensus about surgical repair. Surgical repair consists of a tenotomy, which includes the attaching torn tendon to the bone. The results in full functional and muscle power recovery, as well as good cosmetic outcomes. Patients who needs maximum supination strength (e.g. manual labour like carpenters and port workers). Patients lose up to 20% of supination strength with a biceps tear, but that rarely affects activities of daily living. Patients have to wear a mastersling for the first 10-14 days after surgery. Only passive range of motion is allowed in that time. Light exercises is done from week 2 to 6, where after it is progressed to functional exercises between week 6 and 8, and progressed to resistance. After this, moderate loading may be tolerated but heavy loading is prohibited for the first few months. Conservative management of long head of biceps rupture take 4-6 weeks on average. Continue with modalities and ROM. Long head of biceps ruptures commonly occur in the population between 40 and 60 with predisposing shoulder problems. It can also occur in the younger, active population. It is characterized by a Popeye sign at the biceps. Conservative management consisting of analgesia and physiotherapy is the treatment of choice for the older population, and for patients that does not need full supination strength, as an up to 20% loss with biceps ruptures are normally present. Surgery consisting of a tenotomy and re-attachment of the tendon are mostly reserved for the younger, more active population; patients who cannot aesthetically accept the Popeye appearance; as well as patients needing full supination strength (mostly for manual labour). Physiotherapy plays a massive role in both the conservative, as well as post-surgical management of a long head of biceps rupture. ↑ 1.0 1.1 1.2 1.3 1.4 1.5 1.6 1.7 Gumina S, Carbone S, Perugia D, Perugia L, Postacchini F. Rupture of the long head biceps tendon treated with tenodesis to the coracoid process. Results at more than 30 years. International orthopaedics 2011;35(5):713-6. ↑ 2.0 2.1 2.2 2.3 Shunke M, Schulte E, Schumacher U. Anatomische atlas Prometheus: Algemene anatomie en bewegingsapparaat. Bohn Stafleu Van Loghum: Nederland, 2005. ↑ 3.0 3.1 3.2 3.3 3.4 Elser F, Braun S, Dewing CB, Giphart JE, Millett PJ. Anatomy, function, injuries, and treatment of the long head of the biceps brachii tendon. Arthroscopy: The Journal of Arthroscopic & Related Surgery 2011;27(4):581-92. ↑ 4.0 4.1 4.2 4.3 4.4 4.5 Warner JJ, McMahon PJ. The role of the long head of the biceps brachii in superior stability of the glenohumeral joint. JBJS 1995;77(3):366-72. ↑ 5.0 5.1 5.2 5.3 Quach T, Jazayeri R, Sherman OH, Rosen JE. Distal Biceps Tendon Injuries. Bulletin of the NYU hospital for joint diseases 2010;68(2). ↑ 6.00 6.01 6.02 6.03 6.04 6.05 6.06 6.07 6.08 6.09 6.10 6.11 Medscape. Biceps rupture. Available from: https://emedicine.medscape.com/article/327119-overview (accessed 06/01/2019). ↑ American Academy of Orthopaedic Surgeons. Biceps tendon tear at the shoulder. Available from: https://orthoinfo.aaos.org/en/diseases--conditions/biceps-tendon-tear-at-the-shoulder/ (Accessed 07/01/2019). ↑ 8.0 8.1 8.2 Chen CH, Chen CH, Chang CH, Su CI, Wang KC, Wang IC, Liu HT, Yu CM, Hsu KY. Classification and analysis of pathology of the long head of the biceps tendon in complete rotator cuff tears. Chang Gung Med J 2012;35(3):263-70. ↑ 9.0 9.1 Zanetti M, Weishaupt D, Gerber C, Hodler J. Tendinopathy and rupture of the tendon of the long head of the biceps brachii muscle: evaluation with MR arthrography. American journal of roentgenology 1998;170(6):1557-61. ↑ 10.0 10.1 10.2 Pugach S, Pugach IZ. When is a conservative approach best for proximal biceps tendon rupture? Journal of Family Practice 2013;62(3):134-7. ↑ 11.0 11.1 Krupp RJ, Kevern MA, Gaines MD, Kotara S, Singleton SB. 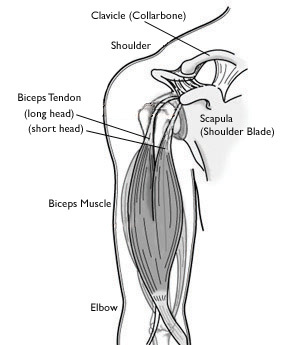 Long head of the biceps tendon pain: differential diagnosis and treatment. Journal of orthopaedic & sports physical therapy 2009;39(2):55-70.